Photo source: Frank Starmer. Some rights reserved. 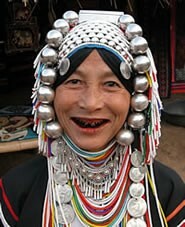 The colorful Akha - called Aini by the Chinese - have their historical origins in southern China. The government considers them part of the Hani nationality, which is a collection of more than a dozen distinct ethnic groups. The Akha themselves consist of "five distinct branches," and possess their own unique customs, culture, language, and dress. 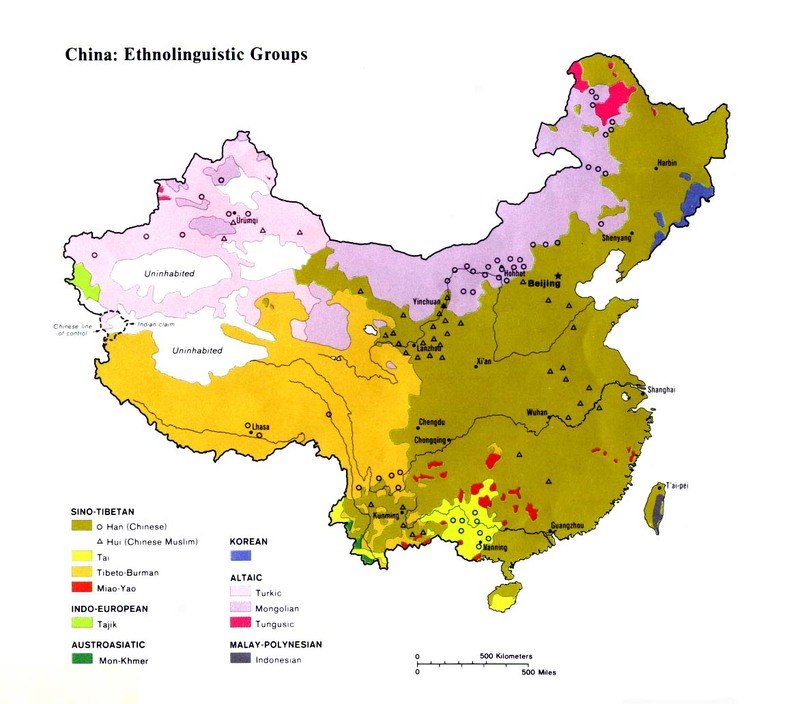 Most scholars agree that the Akha were originally of Tibetan origin. The Akha have a detailed creation epic poem. Long recitations, committed to memory and handed down from parents to children, are essential for continuing the Akha culture. Among the Akha, it is important for a man to be able to memorize his complete genealogy right back to the first man, Sm Mi O. To be unable to do so is considered a disgrace. The Akha genealogy now covers more than 60 generations. Despite being some of the poorest people in southern China, Akha women have a striking appearance. They wear heavily decorated headdresses and skirts. Made from beaten silver, Indian rupee coins, fur, beads, and feathered tassels, the Akha headdress is removed only for the purpose of cleaning and washing their hair. The Akha's religious philosophy, Akhazang (Akha-way), permeates every aspect of their lives and social structure. "Akhazang is a social and spiritual code that guides day-to-day living such as house-building, rice planting and relationships with one another and with other nationalities." The Akha believe in a supreme deity named Apoe Miyeh. They are also careful to appease the "Lord of Land and Water" who they believe is the spiritual ruler of each locality where they live. In Myanmar and Thailand, the Akha have responded in large numbers to the Gospel, with as many as 60,000 Akha Christians reported in Myanmar alone. 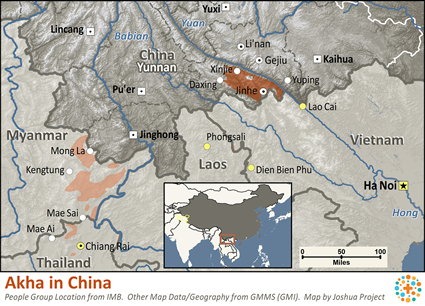 In China, however, only 500 to 600 Akha have believed. In recent years, one evangelist has planted 16 house churches. Missionaries first focused on the Akha in the 1910s but had little visible success. Recently, Akha believers from Myanmar have reached out to their cousins in China. The New Testament has been translated into Akha by missionaries in Myanmar, but the Akha in China cannot read the Roman script. View Akha in all countries. Location in Country: Approximately 400,000 Akha are scattered throughout Asia. About 150,000 of these are located in southern China's Yunnan Province. Today the majority of Akha live in Myanmar, Laos, Vietnam, and Thailand. In China the Akha primarily inhabit Xishuangbanna Prefecture, which has a lazy, slow-paced feel. The prefecture is home to approximately 30 ethnic groups, of which the Akha are one of the most visible.